Picnic lunches are the perfect summer treat. Don't you find there is something about fresh, clean air that increases your appetite? And food just tastes better when you are sitting beneath the cooling shade of a tree, or sitting crosslegged on a slightly sandy beach blanket, a light breeze ruffling your hair. True, picnic lunches take a little careful planning, but there is no need to be overwhelmed by the idea of hulking coolers, and hibachis and various other bits of equipment to your location. Truth is, the simpler the better. A low fuss menu and a few simple pieces are all you need. To keep sand and grass, and of course ants from ruining your meal be sure to pack a sturdy blanket. 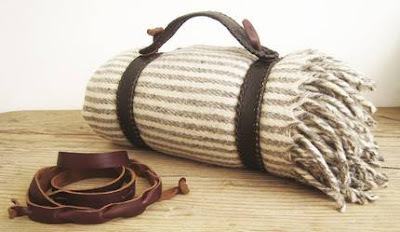 To make sure the transport of the blanket is easy, try this handy and sturdy leather blanket strap. (Hint... use it to transport your yoga mat off season!) Find this strap (free with blanket purchase) in the shop of mexchic. 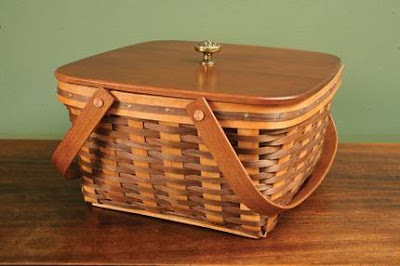 A handmade picnic basket is the perfect way to transport your picnic lunch. Sturdy and beautifully crafted from from American Cherry and Black Walnut woods and finished with solid brass tacks. I found this in the shop of mattfeve. And to make sure that you have all your utensils at hand, and never leave with sticky fingers, tuck one of these handy roll-ups into your picnic baskets. 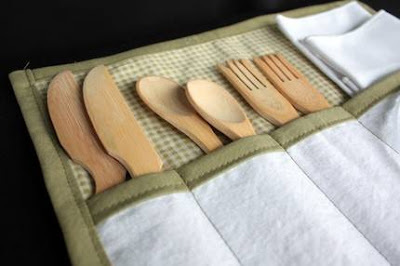 They come complete with two sets of bamboo utensils and two cloth napkins. No waste! Find these in NstarStudio's shop. 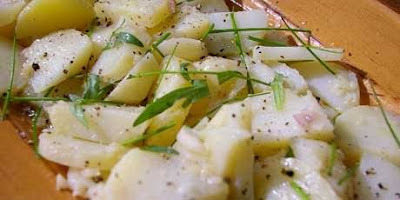 Finally, what is a picnic without potato salad. I borrowed this from my favorite foodnetwork.ca host, Laura Calder. Click on the photo to find the recipe.